The National Children’s Commissioner, Megan Mitchell, believes that children and young people are experts in their own lives and so, before she can work out what needs to be done, she needs to ask the experts! As Commissioner, it is important for Megan to listen to and to speak with children and young people, and the adults who work with and for them, about the rights of children and young people in Australia. The Big Banter is her way of making this happen across Australia. She will be asking children and young people directly what they think her priorities as Commissioner should be. She’ll also be getting their advice on what they think is the best way of making sure that she continues to hear from children and young people on a regular basis. 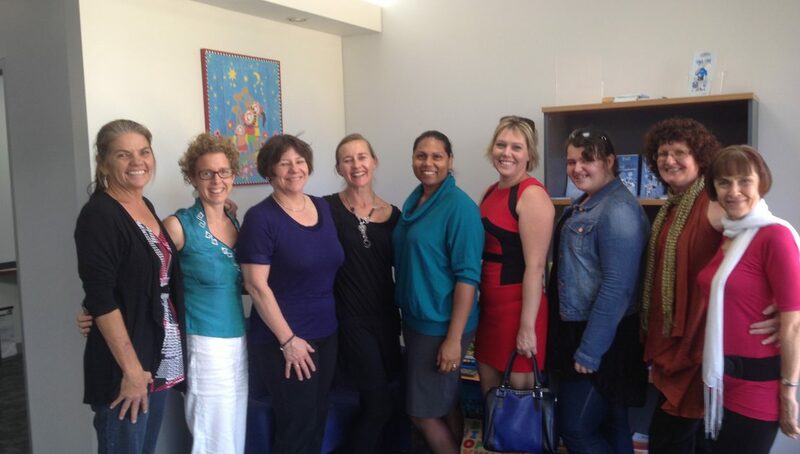 Megan met with the NAPCAN staff and many other Peak Bodies and organisations that work with children and young people. Photographed, from L to R: Nancy Jeffrey (NT Manager Save The Children), Ellen Poyner (Senior Project Officer/Trainer NAPCAN), Megan Mitchell (National Children’s Commissioner), Trista Cocker (Senior Project Officer/Trainer NAPCAN), Jane Wilson (Operations Manaer SAF,T), Amanda Markwell (Development Officer, SAF,T), Christine Gardiner (our young Roving Reporter), Lesley Taylor (Manager NT NAPCAN), and Sandy Hyde (friend of NAPCAN). You can follow The Big Banter and the tour around Australia on Twitter @MeganM4Kids and Facebook.